A new Abacus Data National Poll finds clear differences in how Canadians view Canada’s major political parties. “We wanted to go beyond the ballot numbers and understand what Canadians think of each political party represented in the House of Commons,” said Dr. David Coletto, CEO of Abacus Data. Respondents were shown 16 statements and asked which applied to the political party in questions. 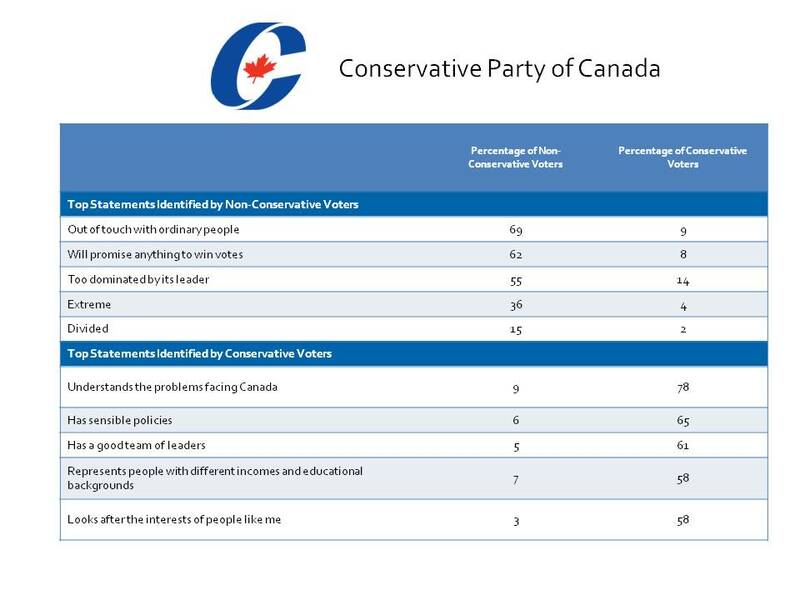 The Conservative Party brand, while most popular in terms of voter preference, is highly polarizing. Conservative Party supporters believe the party understands the problems facing Canada, has sensible policies, and has a good team of leaders. For non-Conservative supporters, there is little love for the Tory brand. Seven in ten believe the party is out of touch with ordinary people, 62% said the party will promise anything to win votes, and 55% said the party is too dominated by its leader. The Liberal Party brand was conflicted. 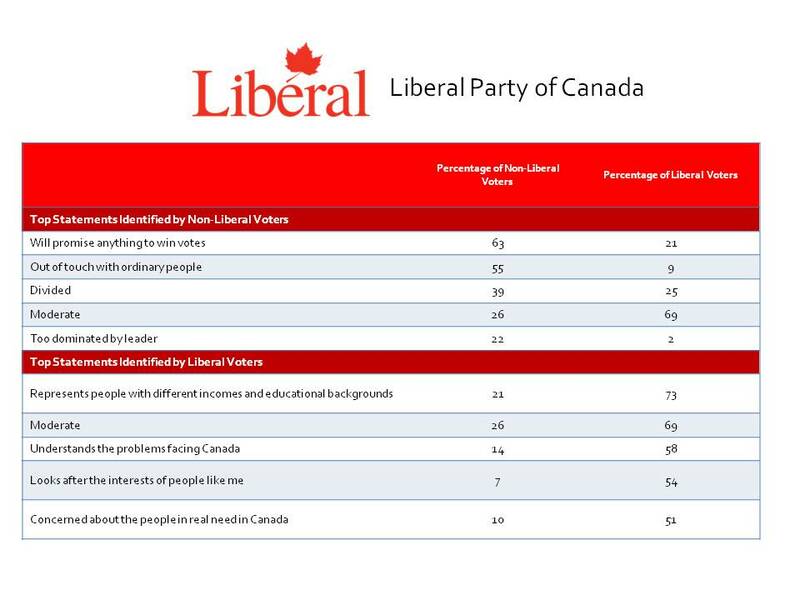 Among Liberal supporters, most believed that the party represents people with different incomes and educational backgrounds, is moderate, and understands the problems facing Canada. Around 20% of non-Liberal supporters shared those viewers. 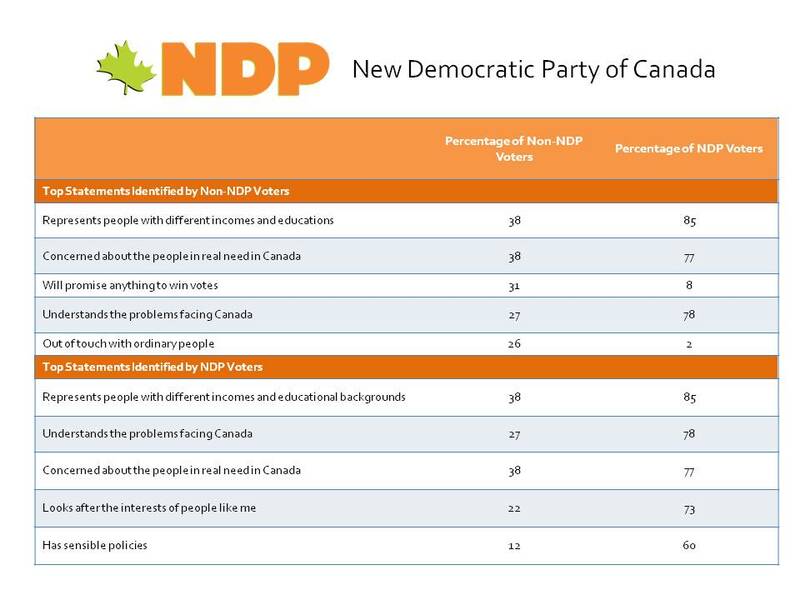 The NDP brand is much healthier than either the Liberal or Conservative brands. Although more people have no opinion about the NDP, both supporters and a large percentage of non-supporters see the party as representing people with different incomes and educations and being concerned about the people in real need in Canada. Between December 3rd and 6th, 2010, Abacus Data Inc. conducted an online survey among 1,361 randomly selected Canadian adults from an online panel of over 100,000 Canadians. The margin of error—which measures sampling variability—is comparable to +/- 2.7%, 19 times out of 20. Results of the survey were statistically weighted by gender, age, region, and language using census data from Statistics Canada and by past vote using Elections Canada results from the 2008 General Election. Totals may not add up to 100 due to rounding. More interviews were completed in Atlantic Canada and so the weighted total of interviews does not add up to 1,361.